Warning: This site is still under construction. 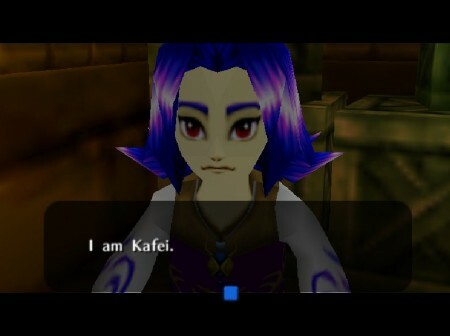 During his youth, young Kafei was a member of the Bombers Secret Society of Justice. 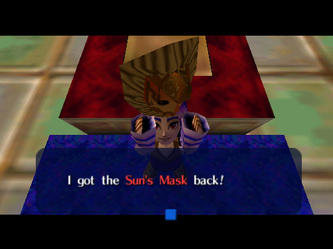 The owner of the Curiosity Shop states that he was a childhood friend of Kafei's and gave him the Keaton Mask as a gift. Later, Kafei eventually fell in love with Anju when they were children and they became engaged. They promised each other to marry on the day of the Carnival of Time, exchanging the masks of the sun and the moon during the event. However, several years later, Kafei was suddenly turned into a child by the possessed Skull Kid. 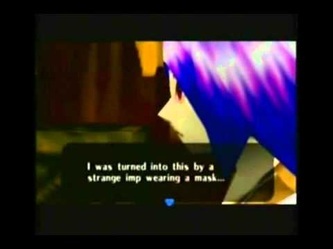 On his way to see the North Clock Town Great Fairy about his desperate situation, Sakon came along and stole his wedding ceremony mask. 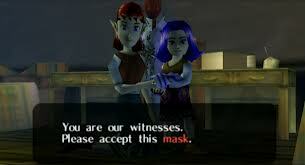 As such, Kafei could not return to Anju despite knowing that she was worried, for he had promised her to greet her with his wedding mask in hand. He goes into hiding at the Curiosity Shop and disguises himself with a Keaton Mask that the Curiosity Shop owner gave him when he was a child, secretly watching all of the customers of the Curiosity Shop (which sells stolen goods). He is positive that the thief will appear and he will be able to follow him to retrieve his mask. 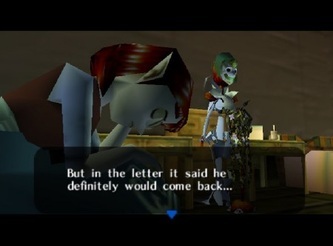 Despite Kafei's terrible fate, Anju does not know what has become of him or why he disappeared. She is afraid to meet her fiance and hear the reason as to why he escaped, for she fears his disappearance might have been caused by her. 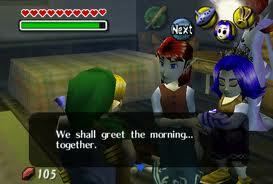 In Majora's Mask, Anju is the inn keeper at the Stock Pot Inn and the best friend of Cremia, the owner of Romani Ranch. She is currently engaged to Kafei, Mayor Dotour's son, and they plan to have their wedding on the day of the Carnival of Time; however, certain circumstances have caused Anju to start doubting her fiancé. Although her father, Tortus, has passed away, her mother and grandmother live with her in the inn. 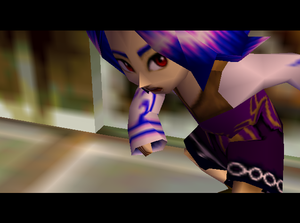 She is one of twenty characters in the game with an entry in the Bombers' Notebook, and nearly all of her entries are related to the "Reuniting Kafei and Anju" sidequest, in which she plays a key role. Anju is portrayed as apologizing quite often and appears somewhat nervous. She is not a very good cook and, according to Kafei's diary, tends to leave things until the last minute. She also seems to have trouble remembering customers' faces, which can cause her to deliver reservations to the wrong person. Because of her involvement in the largest sidequest in the game, Anju is one of the most developed non-playable characters in the game. 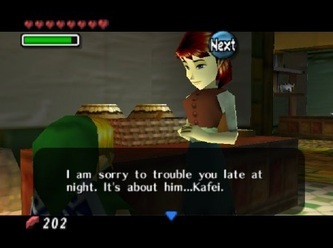 If Link hangs out around the Stock Pot Inn for an entire three day cycle, he can quickly learn a lot about Anju and her personality.